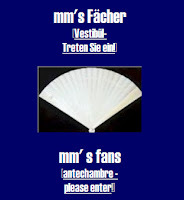 I always wanted to have one website where I can find everything on fans. Well, this may be a bit over-ambitious, but let's try to see where we end. 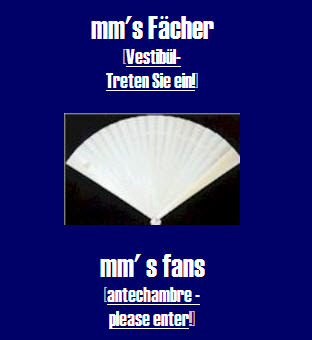 Here the beautiful websites of fan friends - and if I forgot some, write a comment and add it! The photo left is my old website - static pages that are no more up-dated but still with some interesting topics, like celluloid fans, love symbols on fans etc. and another Italian fan website. [Another one does not work any more, www.ventaglio.it). A website about flag fans.